Vacant Ritual Assembly #4 is an OSR zine by Clint Krause. The PDF costs USD $2 Onebookshelf (aff), the print version costs USD $4 with worldwide shipping(!). This 22-pages-magazine is written with Lamentations of the Flame Princess in mind and thus contains weird and gothic horror stuff. I'm a subscriber of the zine and so far I have been impressed by the quality of the work. The zine begins with an editorial, a campaign update of Krause's group and some media recommendations (i.e. the From the Vats adventure by Gavin Norman). The Abstract describes a strange drug den hangout with some weird occupants. For me, this was mostly a fun read and nothing I could use immediately at the table. The next item is the gem of this issue: The Lotus Eater, a small adventure inspired by Rafael Chandler's Narcosa setting book. This is a great plug-in module as the players will be transported into a parallel realm. There is a hook which draws the players in and then they can encounter strange things in The Domain of the Cruel Lotus Czar. 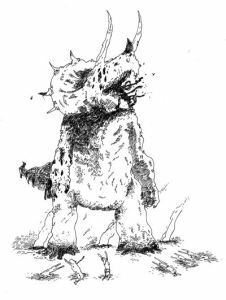 There is the Smoke Wolf who resides in the a sporest (spore forest) and the Godhead Citadel, a small dungeon within a stone head. So strange! The dungeon is a bit static but all in all, the adventure is pretty neat. I like how the players can cleverly incorporate background information into the solution to this quest. Next up is a guest post from Anxious P. called The Oolai Cloth-Skins and Dragon Blackhide Bastards which describes the strange mystical practices of the Oolai People who weave fabric onto their children which give them special powers. Interestingly, the author provided a method for the PCs to get access to the cloth-skins, too as there are shunned practitioners who sell their services to foreigners. Another strong entry is Furious Gods, a small hex map with three barbarian tribes. They worship entities like a Ghost Ape or Impalor, the Armored Death, a giant dinosaur triceratops (!). The Gnashmaw tribe keep velociraptors as cattle (?). There are guidelines for playing as one of the barbarian tribes and stat blocks for the trips and their champions. Finally, we have an interview with David McGrogan. He is the mastermind behind Yoon-Suin, an oriental old school setting book (which is genius!). The interview was interesting to read because he explained how Yoon-Suin came to be, about game prep, about how he writes and more. I really find McGrogan's view on world-building fascinating perhaps because it aligns a bit with my own. Another great issue of a weird old school fanzine. There is a lot of inspirational material as well as things you can use in your campaign. Again, this is for those of us who like grotesque and eccentric stuff. If you like straightforward fantasy without gonzo elements this might not be your cup of tea.